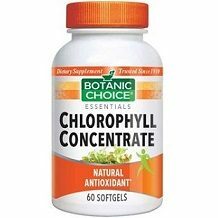 Read our review below to learn all about Botanic Choice Chlorophyll Concentrate. The maker’s of this product formulated it as a treatment for body odor and bad breath. The medical term for bad breath is “Halitosis”. Halitosis can be caused by the consumption of certain foods, poor oral hygiene, alcohol or tobacco use, dry mouth, or by chronic medical conditions. The main ingredient in the product is Chlorophyll Complex. Chlorophyll is a pigment found in plants and is used for bad breath and reducing colostomy odor. The inactive ingredients in the product are Soybean Oil, Gelatin, Glycerin and Purified Water. The capsules are not suitable for vegetarians and vegans because they contain gelatin. The product is free from artificial color, flavor, sweetener, preservatives, sugar, starch, milk, lactose, gluten, wheat, yeast, fish, and sodium. Take 1 capsule one to four times a day with meals. The manufacturer does not specify the best times of day to take the capsules nor how one decides the dose. No side effect information is provided by the manufacturer. Consult with your physician before beginning any new supplement especially if pregnant, nursing, taking medications, or have an existing medical condition. You can purchase a 60 capsule bottle of this supplement directly from the manufacturer’s website where one bottle costs just $4. Delivery is a flat fee of $5.95 within the U.S. If you submit your email address, you can get 15% off your first purchase. There are no further discounts for bulk purchases. There is a one year guarantee and return policy for this supplement. If who are unsatisfied with the results they see from the product can return it to the manufacturer to request the refund. Opened bottles are not included in the return policy. Return shipping and processing are added charges. Some advantages to this product include the following; the product is free from artificial color, flavor, sweetener, preservatives, sugar, starch, milk, lactose, gluten, wheat, yeast, fish, and sodium. At just $4 for a 60 capsule bottle, this is a cheap product to buy. When you order for the first time, you can get 15% off the purchase price by submitting your email address. There is a one year long manufacturer’s money-back guarantee. We felt that the product was let down in a number of areas however. In terms of dosage instructions, it is unclear who is supposed to take one capsule per day and who should take 4, the manufacturer did not explain the criteria for this decision. They also did not explain the preferred time to take the capsules. The capsules are not suitable for vegetarians and vegans because they contain gelatin. There is also no explanation of possible side effects or warnings on the website. Although the price is low, there is no explanation of shipping costs. The money-back guarantee does not include the option to return opened bottles of capsules, and return shipping and processing are extra. When we checked the customer testimonials, we found mixed reviews but many people did not experience any marked improvements after using this product. It lacks the guarantee of being made in an FDA certified facility, and there is no assurance that it is free form fillers and binders. For all these reasons we suggest that you look for a different supplement for treating body odor and bad breath.